As the professionals say, the game is 99% mental and 1% skill; if you let the shooters get in your head it will mess with your game: a confident keeper is a better one and you need to know how to deal with the rigors and pressures of the sport. ‘Swagger’ is not exactly what you expect to think of when referring to hockey. But when it comes to goalkeeping (which is a part of the sport! ), then you might be open minded in reconsidering! I’m not sure how it will translate internationally with the translate feature though! ‘Swag’, without sounding trite (I’m not exactly the definition of ‘street’ and it’s not exactly something you expect in the hockey community!) is a phrase often used when it comes to ice hockey, with goalies talking about how they look, and how they can experiment with pad colours and set-ups to look better and stylish! 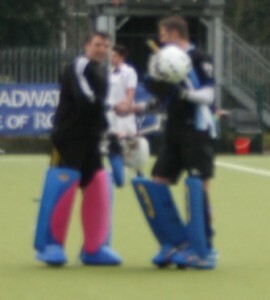 Who said goalkeepers didn’t have style?! Well, in ice hockey, they can specialise their kit (we still can; Obo obviously offer the chance for two tone pads but not many do, although Monarch are introducing it!) and ‘dress up’ to ‘look the part’ and ‘cool’. I did play it for a bit (bit of a goalie connoisseur trying my hand at most sports, although do play outfield occasionally!!) and still pay attention to forums and blogs etc. for thoughts and ways of ‘thinking outside the box’; Justin Goldman s a great goalie writer and inspiration and whilst ice hockey is obviously a totally different technique and way of playing in goal, has a great level of insight for the mental game and psychological aspects of sport. But regardless, it’s just a way in to contemplating body language and how you appear to your opposition. Easy to beat or hard to beat? You may not have played them yet and you don’t want to give them the wrong impression! I wanted to write about the conceptualisation of ‘swagger’ as a chance to discuss self belief, and thought this would be a good way in to introduce exploring the mode of self belief that has to be learnt through experience effectively and that potentially cannot be taught. You have to play like it and have the personality to match! It’s a great way of looking at how confident you are on the pitch. You NEED to be confident, because it’s arguably the most pressured position on the pitch and if you’re not confident, you want play to your best or ‘do yourself proud’ with your performance. Self belief is either natural and deeply inherent for the person, or is buffed up by things that make you feel confident. You have to really trust in this positive self perception, or things can go belly up as you doubt your abilities and back away from tackles etc. or plays where you need to be aggressive with your play. Thinking about ‘swagger’ is just a vehicle for contemplating how your confidence comes across, a way of establishing this in the ‘mental game’ of the goalkeeping world. Look good, feel good, play good. It’s something that Obo discuss and makes a lot of sense and may be useful for you. But it also affects how your opponents see you. Look like you are unbeatable and they may feel you are going to be hard to beat! And conversely, look like you are a bad, and you may just well let in a few too many (bad days at the office aren’t fun!). Plus if you feel like a nervous wreck and things don’t go to plan, you may end up probably playing bad as doubt creeps in, so better to look hard to beat and not let things get to you! Psychologically you want to endorse this self belief so that you can play like it. Mind games and that malarkey may well also come into play as you get the opposition to believe you really are that unbeatable and going to stop them every time! 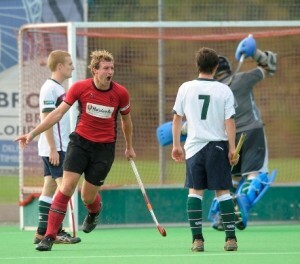 ‘Swagger’ as previously discussed, can easily be considered in the way your kit looks. That are lots of goalkeepers in the elite leagues that have pretty nice looking set-ups, even if the look is pretty standard (all red for TK right now etc. but Obo allows for the customisation for ‘swag’!). David Kettle (Welsh international) had a particularly swish blue and black colour look whilst at East Grinstead (the blue tk rhp helping complete the look!) and is now back with a more blue look (orange inners) at Surbiton after playing with a more mismatching look so far this season. 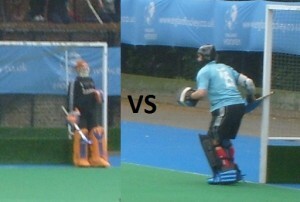 Whilst Richard Potton at EG has a more orange look throughout, with blue on the inners of his pads. Aside from having kit that is shiny and well looked after, I’m not really sure how else you can look the part! Goalkeepers who will always look to experiment with kit, so even then, if they decide to use different types of kit for playing style and technical reasons, then it isn’t going to be a complete picture or universal set-up! But ‘swagger’, like the way the ‘kids on the block’ talk about, is a lot about how you hold and present yourself. Fashion wise and also looking rough and tough. In a game if you look comfortable and seem like you’re going to stop every shot that comes at you, then your opposition is going to treat you so with more respect. But in goalkeeping, along with the loud verbal commanding of your defence, you want to cut a composed and yet imposing figure, an impression of cutthroat last man back to shut down their attacks. One example is when I went along to see England in some international games a few years back. And watching from the stands and observing the goalkeepers in the game, was surprised to see Brothers look a little poserish (not a word and don’t mean to sound condescending, just how I saw things at the time!). It was a weekender against India. ‘Fairy’ (James Fair) played the first game and it was Nick Brothers’ turn ‘in between the posts’. The way he held himself and the air and presence about him as if he thought he was the best in the world (or something like that, I don’t know how to phrase it; I’ll never be that good and I do rate him highly as a ’keeper anyway!). I thought it a little odd and different. But it makes a lot of sense now looking back in retrospect. If playing in front of a large crowd (probably not as big as the crowd at the England game, unfortunately!) and the added pressure, you can let the nerves get to you a little and affect your performance or you can overcome it by ignoring it and come across confident. Oriol Fabregas at RC Barcelona also comes across pretty emboldened. In this way, you’re doing the opposite of letting things and the opposition get to you; you’re showing that you are not nervous (even if you might be, by a tad!) and actually raring to go and stop everything that comes your way. ‘Gigi’ Buffon for Juventus and Italy and all time legend is a great footballing example of this; the way he stands high at corners and just carries himself looking confident the whole game. And he’s one of, if not often, the world’s best, so who can argue against that! To extend and twist the metaphor, you can also consider how you express your confidence in the way you look (when not in your ready stance etc.). ‘Standing tall’ as a phrase (generally applied to life!) 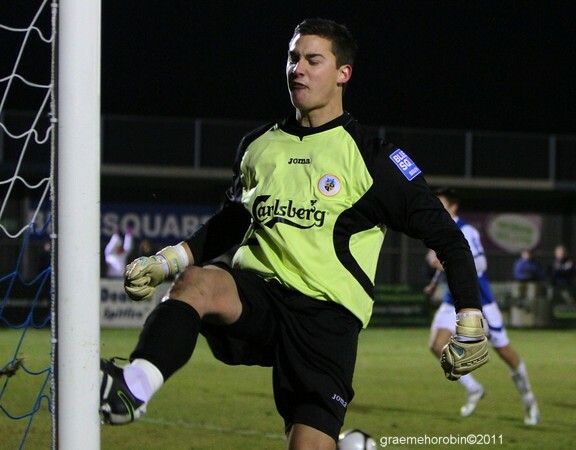 when applied to goalkeeping relates to bringing your ‘A game’ and giving your all no matter how good your team is (i.e. if you’re being shelled, you still do your best to stop every shot! ), but can also in a sense relate to how you appear and how confident you are. 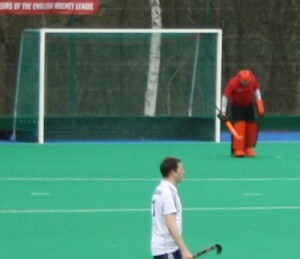 Outside of goalkeeper, it’s been well researched that if you are hunched up, you feel worse mentally. Physiologically and psychologically impacting how you act. If you look hunched and crunching inwards, yousay a last corner of a game when the whistle has blown! So in this sense, with body language, you are coming across to the opposition as not particularly confident in your own abilities. Personally, I just think I know too much random stuff, but I really do think it has a lot of impact for psychology and thus worth considering when thinking about the ‘mental game’ as a goalie in hockey. I’m not sure how this is understood in sports science, but theoretically makes a lot of sense. A straight back is needed in your ready stance anyway, but if you hold yourself upright as discussed in the following, you appear more content (you should be happy to be there, you’re in goal after all and you’re supposed to love it!) with the pressures and confident. robe demoiselle d’honneur? Peut-être vous devez penser à une rouge élégante et romantique. Notre boutique bellerobemariage.fr vous fournit des robes demoiselle d’honneur qui varient en termes de tissu, conception, longueur, etc. Une robe en mousseline à A-ligne décolletée en V longue au sol ou aux genoux sera votre choix idéal. If you want to win the league or a tournament, you’re going to learn how to win. Here’s a rough guide! The object of any game (whether you feel that way or not or otherwise!) is to win. And as a goalkeeper we hope that we can consistently play in such a way that we can lead our team to victory time and time again. But it is not always that easy, with the elite goalkeeper able to carve out a reputation for success by rising above the challenges they face. Whilst some goalkeepers potentially get an easy ride by playing on a strong team, the great goalkeeper will be able to find ways to win even on a mediocre or poor team, aware of what they need to do during a game to secure the points. Take Julio Cesar at QPR. Yes, different sport and they haven’t won many (Green got their first win ironically! ), but he is able to consistently put in mind blowing performances to keep a clean sheet and earn a draw, like the recent game against Chelsea, helping them come out on top at 1-0. What more can you do than not letting any goals in week in week out?! So in this vein, you should look to emulate this success in your own season, being able to battle through adversity to earn the points and be the hero! Even though the art of practice and training tries to boil down the art of goalkeeping and sport in general into a series of routine actions, it is not always that simple. Get set in your stance, be on angle, react to the shot and make the stop, that kind of thing. But a lot can happen in a game and it won’t always go to plan. So it is important to be able to control the controllable. Getting the job done means being able to make the simple easy looking saves that are just as important as the spectacular, breath taking ones; make sure you are able to stop the ones coming straight you and don’t give away those ones that make you blush. The goalies who are really the crème de la crème are the ones that can make the game changing saves; they know it’s happening and they pull it off nonetheless! In other sports this may be more obvious, like ice hockey where a big save changes the whole momentum as the time rushes up the ice to counter-attack after a big save, but they can be just as game changing in our sport. Breakaways, interceptions against a forward through on goal or decisive penalty corner saves when the game is tied, that kind of thing. These kinds of saves can happen at the start of the match when the opposition could gain the lead or at the end when they could tie it up or win. You need to have the mental strength and level of concentration to be intensely aware of the need to pull this off, keeping your team in it with a chance to take the full points. The time to change the game is in your hands and the best goalkeepers will be able to do it on a consistent basis! To win on a consistent basis it needs to become a regular habit, almost a routine. Whether or not you have little to do behind a forward pressing, attacking team, or end up facing a lot of shots behind plenty of defensive breakdowns, the best goalkeepers will find a way to win the game. All the great goalkeepers will win behind high scoring (5 to double figures) or low scoring games (1-0). This is the consistency: the ability to perform well game in game out to allow your team to win. It is the ability to win no matter how many shots you face, to be able to make the game winning save on its own, or the multiple saves that will deny the opposition a comeback. This boils down to not getting to high or low emotionally as things start to rattle your cage as you have to battle against it. Play the full 70 minutes to the best of your ability, not being mentally affected by the score line and give yourself the chance to do your best. Don’t get dismayed, just focus on shot stopping: the team is the one who wins the game, not you, by scoring (well, that’s the way I see it!)! You just have to make sure you keep it that way! Being confident is an essential part of goalkeeping aside from the technical aspects. To win you have to believe you are good enough! Think of Roberto Mancini’s comments about wanting Hart to be cocky. To make those saves and change the game, you have to really believe in your abilities otherwise you will doubt and make mistakes that gift the opposition. Often it comes from within, whilst it may take time, encouragement and strong performances to prove it to yourself. It’s something I intend to write about: be cocky, not arrogant because if something happens you didn’t expect as you said you wouldn’t let it, then you’ll end up looking a wally and your team might doubt you or it could damage that confidence! 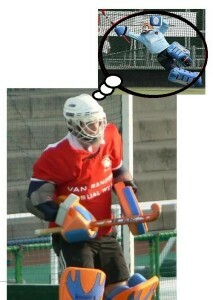 Confident goalkeepers believe they will win the game no matter what and make the tough saves look like no big deal. Like Patrick Roy’s brand of confidence (Google for some of his Stanley cup quotes!). They are so confident, they know they are going to stop everything, rather than just ‘can’! This confidence comes from hard work and performing well. Self belief is not about whether your coach thinks you’re good or your team does; you believe you’re good! Taking every step (mental preparation, stretching etc.) to ensure you’ll win helps this. Being confident is great because it has a knock-on effect you might not have thought about. If you exude confidence, everyone else will play confidently as they reflect on their own ability to play well and do their best. Confidence rubs off! A team is confident when they know they don’t have to cover their eyes when a shot comes in, they know the goalkeeper is going to bail them out so they don’t worry as much! Think about being a team mate of Gomes when he was playing badly. Play well and your team will appreciate it! Goalkeepers who don’t have to prove themselves in my opinion won’t do as well. If you’ve got something to prove, you’re going to work harder and be more competitive. If you don’t have things handed to you, then you already have motivation to outdo your competition. BUT even those that have proved themselves will continue to work hard as they push their abilities to the limits, if they are the elite, because they don’t want to just want to be good, they want to be the best! Tenaciously battling in training and more importantly in games, to play the best they can and give their team the best chance of winning is where it’s at. They’ll outwork you and fight to make sure they stay first choice, it means that much to them! Battling against the odds is a lot of fun if you want to show you’ve got it as I found in my time as you are the underdog: what do you have to lose?! The stronger-willed goalkeeper will be the top of the pack. The goalkeeper who is determined to win and passionate about goalkeeping will be the best and their desire is noticeable and easy to spot. Taking extra shots in training, doing fitness outside of organised training, the things expected of an elite athlete anyway! Time not doing this is time wasted to them. This is an aspect of your ‘mental game’ you need to work on if you want to get up the ladder of hockey. It’s a hard task to win on a regular basis and takes time and effort and the passion to win to pull it off. Even if you are on a team stacked with talent, take De Gea at Manchester United, you still need to make important saves as theoretically the less chances a team has the more they will take them as they are limited by the defence (i.e. they will be of a higher quality as they can’t waste the chance on goal and aren’t merely ‘throwing’ shots on goal). And make sure you don’t have ‘a bad day at the office’ if anything else because that won’t help your team out! Be strong, be bold, believe you’ve got the ability and go out there and prove it! Ultimately, you want to play to win. From the outset of a match, you should be totally focused on the game and winning and nothing else. This is the level of intense concentration of the elite goalkeeper and you have to match it if you want to win that badly! Love goalkeeping and love to win and find ways to win and you’ll be alright! Just make sure you can do it consistently! Being scored on isn’t fun but if you let it get to you, you won’t perform to the best of your ability. A goalkeeper’s job is never easy and when faced with the task of being unbeatable the pressure can often be intense. Being scored on and allowing goals is part and parcel of being a goalkeeper, but it’s how you respond to that that shows how good you really are. In sport they often say how important the mental game is and with goalkeeping it is no different, if not more important. A goalkeeper’s ability to overcome adversity and bounce back shows they have good mental strength and will be able to perform at their best for their team. The best way to respond to a conceded goal is to play like it never happened. Whilst it’s fairly obviously how to forget about it, you need to do your best to put it out of your mind entirely. Ignore the urge to have a go at yourself for letting the goal be scored and work at composure and collecting your thoughts together so that you are prepared for the next chance on goal. Play like it’s 0-0 and forget about the pressure to win. Like the saying “water off a duck’s back” be cool and calm and don’t let it get to you. If you do, then negative thought patterns will sink in and affect your performance. Whilst it is important to consider how the goal was scored, you need to leave that to the training ground. After the game you can look at how you could have stopped the goal, but for now, you need to work at not letting it get to you. If you think you’re going to lose, then the chances are you will because your heart won’t be in it! In the ‘here and now’ of a game (or trial or practise if you’re that competitive! ), your priority is the next shot and keeping your team in the game. Being scored on can easily dampen your spirits and damage your confidence. If you dwell for too long on the goal, then you are likely to hinder your chances of performing well and helping your team get back in the game. The longer you criticise your performance, the harder it will be to self motivate; negative confidence will lead to self doubt which in turn will lead to indecision and poor play which will then lead to more goals if you’re not lucky. Instead, you need to move past the event and refocus your efforts on the task at hand (of stopping more shots and goal scoring opportunities!). As it’s been mentioned your priority is to keep your team in the game and to play your best, not to mull over having let a goal in! By focusing and concentrating on the next shot or attempt on goal and visualising yourself stopping it, it will help from letting your mind wander. Focus your mind on the task at hand: your priority is to not let more goals in! Having seen a lot of games (on YouTube and in person! ), I have noticed a habit some goalkeepers have of openly lamenting the fact they have allowed a goal. Whilst it’s good to be emotional as it shows you care (like Murray’s tears at Wimbledon), it gives the wrong impression. Looking dejected and showing signs of bad body language (even if it’s hard to see your face through your helmet!) is actually a bad idea, giving the opposition the impression that you lack confidence and don’t know what you’re doing. Instead of this, do your best to maintain a level of confidence which will provide a positive sense for your team. Showing visual signs that the team is getting to you isn’t a good idea! Ultimately, the most important thing is to carry on your attempts at being unbeatable. Goals can dash your confidence against the rocks and if you let it get to you it will stop you playing well and ensuring you end up losing. Instead, work to refocus your efforts and carry on playing confidently. This way you can give your team the best chance of winning and the opposition won’t think they can steamroll you.